The bond that two siblings share is stronger than many other bonds you’ll experience. Friendships and relationships may come and go but the family will always be in your life. Therefore, if you’re thinking of getting a matching tattoo with someone, turn to your sister. 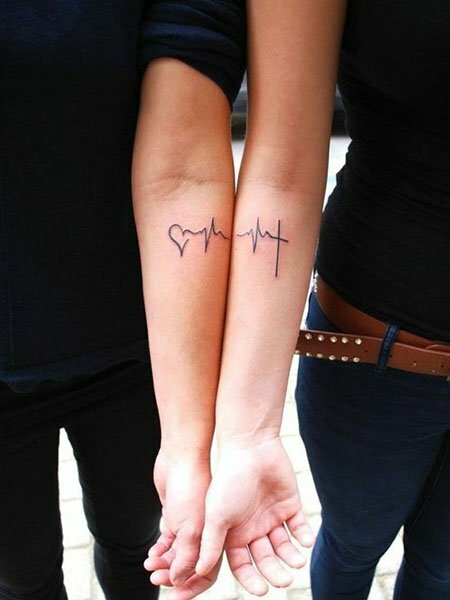 A tattoo is a great way to show her how much you love her and we’re sure she’ll be totally stoked about the idea. 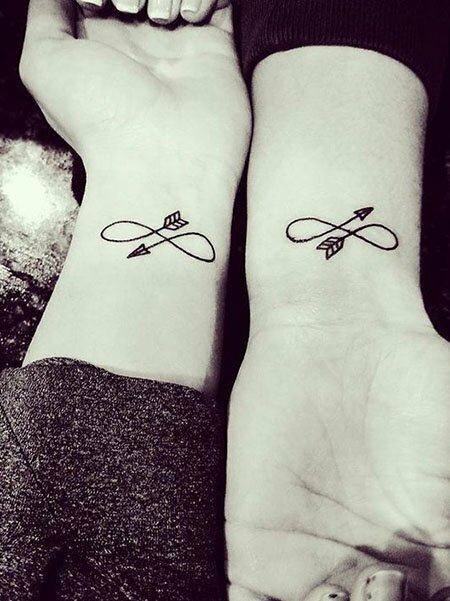 You may even find that getting matching tatts strengthens your relationship even more. If you can think of a tattoo design that has meaning behind it, then that’s even better. So sit down together and brainstorm ideas, after all, you want it to be something that you both agree on. Think of a memory or something that you can turn into a tattoo design and check out our ideas for inspiration. 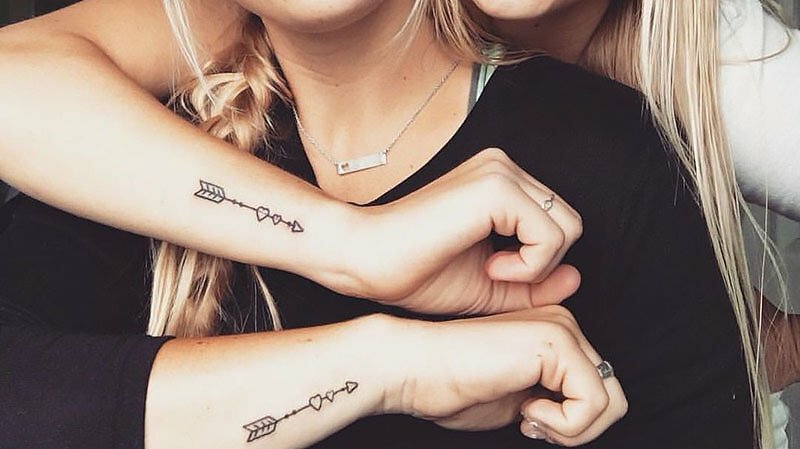 If you’re planning on getting a tattoo with your sister, you may as well get matching tattoos. Otherwise, the message may get a little lost if you both end up with completely different designs. Think of something that you’ll both be happy with, that reminds you of the connection the two of you have. Also remember, the tattoos have to match but that doesn’t mean that you have to get them in the same location. So it’s just you and your sister getting a tattoo together, that means that you can make it sentimental. Think of designs where you each get half of a tattoo, then when you stand together it completes the design. Otherwise, think of designs that are symbolic, such as the ‘pinky promise’ tattoo. With this design, you can imagine that one hand is yours and the other is hers. When there are three of you getting a tattoo together, it generally requires a little more thought. 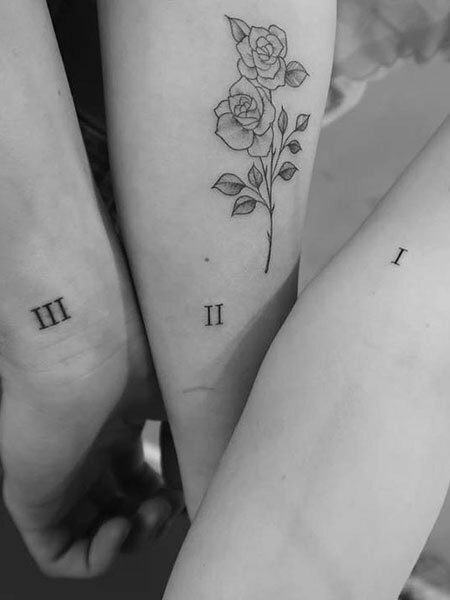 You either have to pick a memory that includes all three sisters, or a design that each of you likes if you’re getting a matching tattoo. Though if you’re thinking of keeping it simple, getting roman numerals in your age order is a great design. It’s very symbolic, without causing arguments on each of you want. 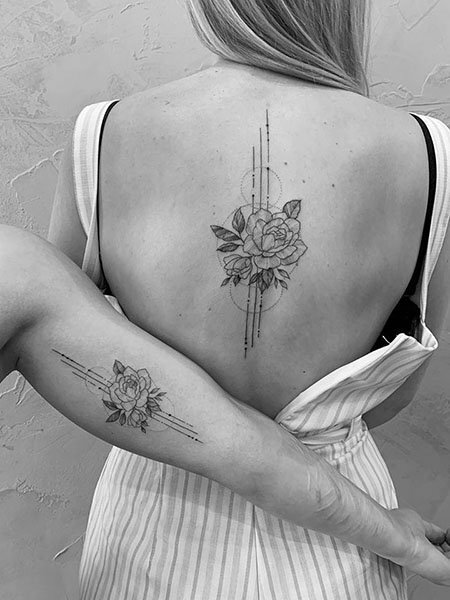 If you’re not a big fan of inking your skin, yet you still want something to symbolise the bond between you and your sister, a small tattoo is a great option. You can even get it in a very discreet location. Generally, the smaller they are, the sweeter they look. 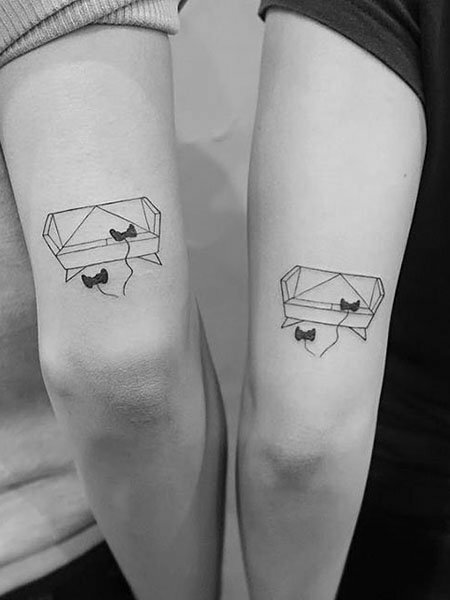 A tattoo doesn’t have to be some great big grand gesture to show how much you care about your sibling, something small will suffice. 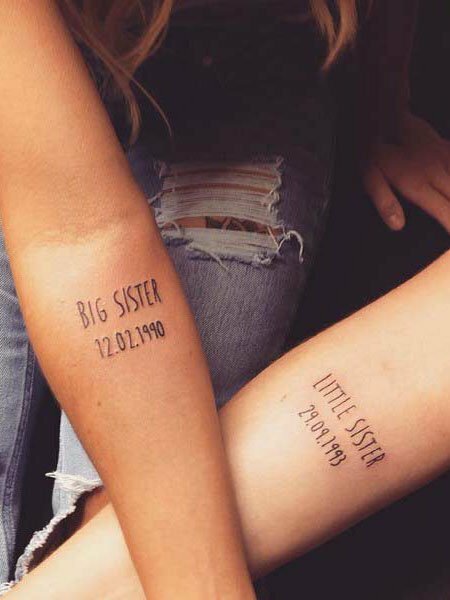 Big sister, little sister tattoos can be scripted, and there are many fonts to choose from. Yours could be bigger or smaller than your sisters, depending on whether you are the older or younger sibling. 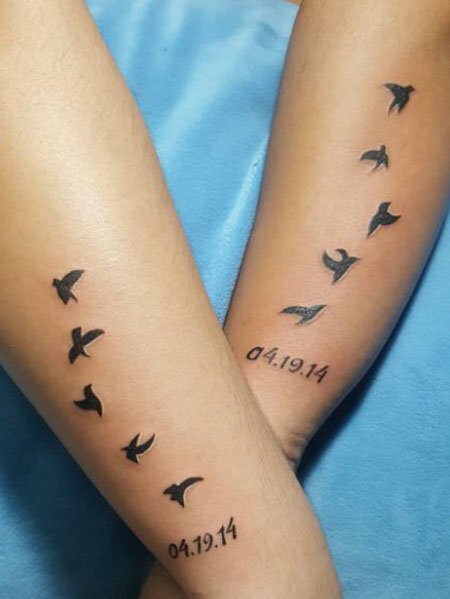 It’s also a nice idea to add either one or both of your birth dates to the tattoo to show your age, her age or the age difference between the two of you. Tattoos that symbolise some part of your childhood, growing up together or any other part of your relationship are always a great way to spark a memory every time you look at your tatt. 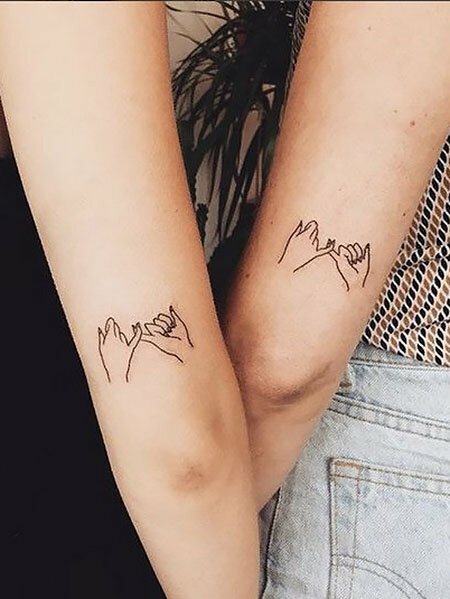 This design could be something like two girls talking through a string cup or even getting a line from a book you used to read together before bed tattooed on you. If you prefer a unique design over something that has meaning to you, that’s also an option, as long as they’re matching. Sit down with your sister and brainstorm a tattoo design that you’ll both be happy with. Even a design without a symbolic memory attached to it can have just as much meaning, knowing that you share something with your sister. Flower tattoos are an easy design to turn to. You’ll find that most girls won’t be opposed to getting some sort of flower inked on their body, so if you really can’t agree on anything, ask your sister how she feels about a flower tattoo. This might even have a symbolic memory behind it, such as when you and your sister used to play, ‘he loves me, he loves me not,’ with the daisies in your backyard. 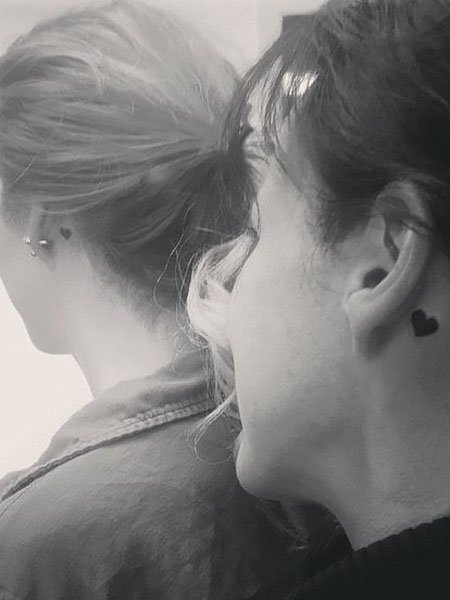 Getting matching heart tattoos is a great way to symbolise how you hold your sister close to your heart. A really fun idea is getting two tattoos, side by side and colouring one of them in. If you’re the oldest, you will colour in the first love heart, while the youngest would colour in the last love heart to also symbolise your age. Bird tattoos can be a really cute way to symbolise you and all of your sisters if there are a few of you. 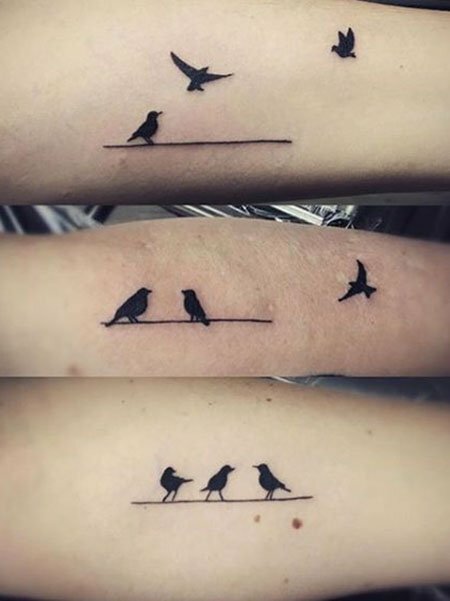 Simply get the number of birds tattooed on you, as you have sisters. You can even come up with a thoughtful design such as birds flying to sit on a line in age order to symbolise which bird is which sister, or a flock flying through the sky, the leader being the oldest, while the one at the back would be the youngest. Maybe back in the days, there was something that you and your sister would regularly do together, such as sitting on the couch after school and playing Super Mario Brothers. Perhaps these memories were some of the happiest of your childhood. Think about whether you and your sister have anything symbolic like that, and if so, think about turning it into a cool tattoo design. 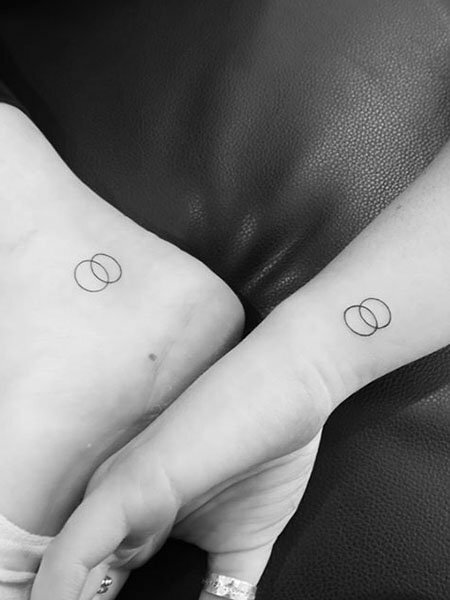 Meaningful sister tattoos can be anything from getting a design of something that reminds you of your sibling, to simply getting the word ‘sister’ tattooed on you, so that it’s obvious who it’s for. There are many designs to choose from that would reflect your unique story. 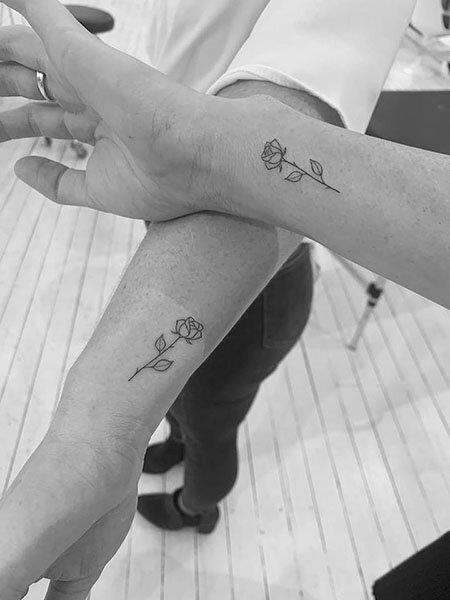 So you’re a twin, and you want to get a matching tattoo with your sister, well why not do just that? 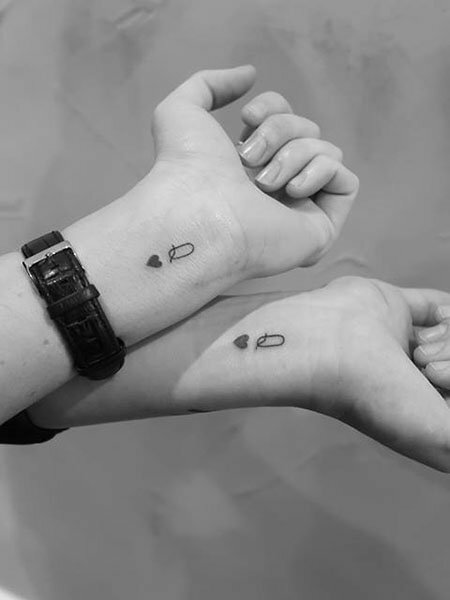 Get half of a tattoo that becomes full when the two of you are joint. 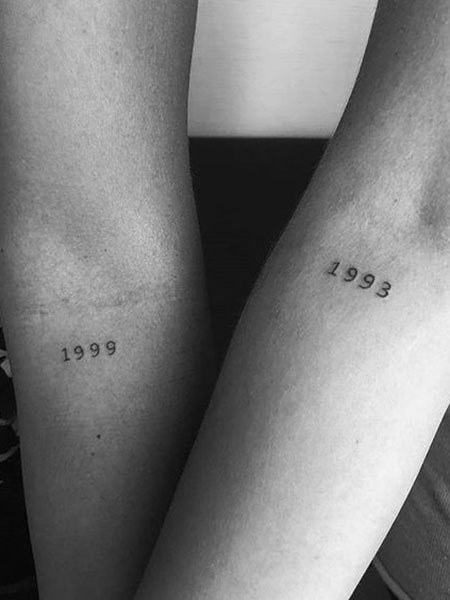 Otherwise matching tattoos are another option or simply getting the word ‘my twin’ inked on your skin with your birth date. 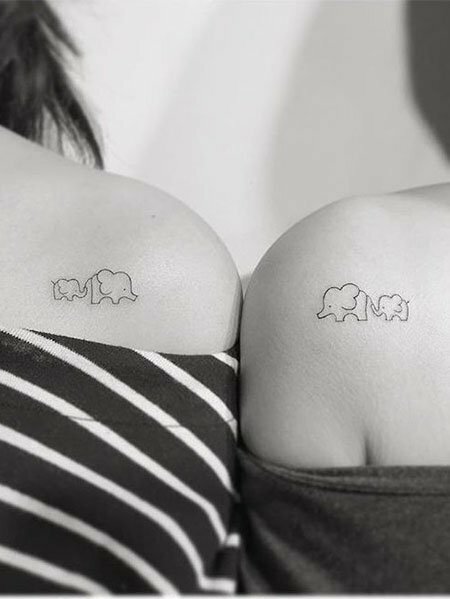 There are various options when picking a twin tattoo, but keep in mind, all your ideas will resemble sister tattoos. Simple tattoos always look sweet, discreet and can still have a lot of meaning behind them. For instance, two linked circles can represent you and your sister, and the bond that you share, through the attachment of the hoops. 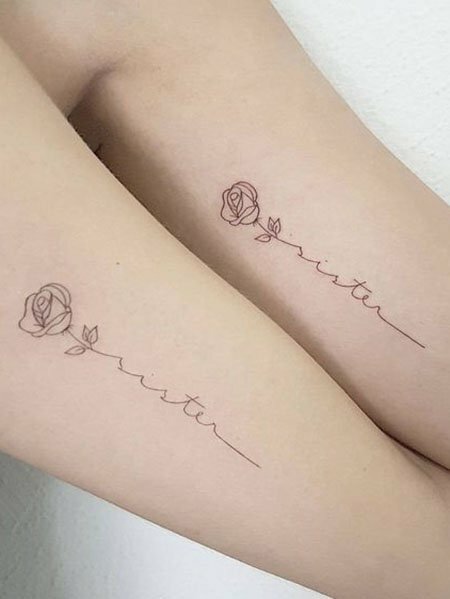 Simple tattoos are also easy to place on your body as they’ll fit just about anywhere and aren’t always the most noticeable. 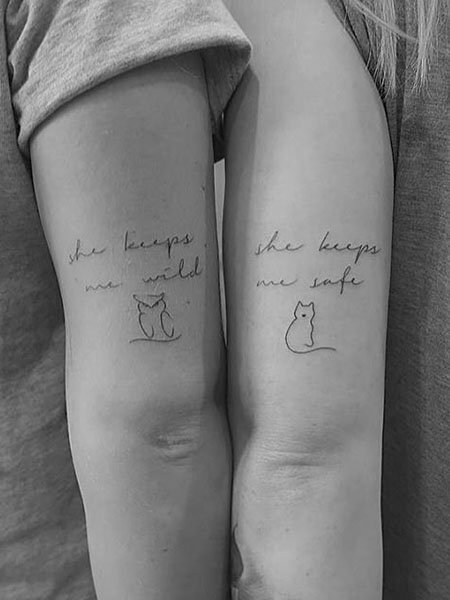 If you have a quote that describes you and your sister or one that resonates with you both from a book of poetry, this can be a great tatt idea. It’s best to find a quote that represents the bond you have or describes the relationship between the two of you. “She keeps me wild,” and, “she keeps me safe,” usually go hand in hand. There always seems to be a care-free sister and one that cautions on the safe side. Together they are the perfect combination. 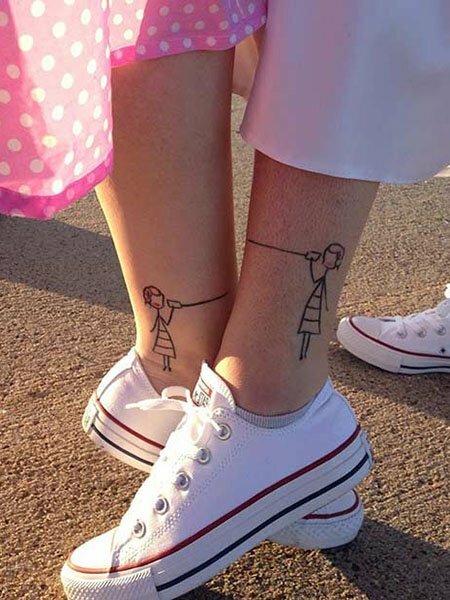 If this is you and your sister, then this design is a wonderful idea. For twins especially, this is a beautiful design. 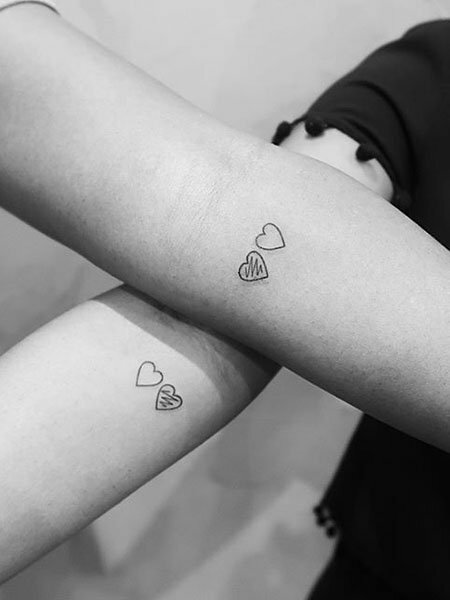 If this is the tattoo that you and your sister have decided on, remember that it can look a lot sweeter if you add shapes, such as a love heart or cross to the design. It’ll look a lot better rather than just getting jagged lines. 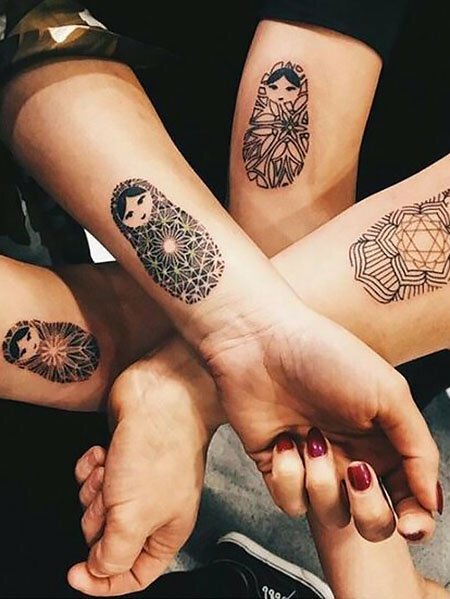 Matryoshka dolls can be very symbolic, as each one is designed smaller so that they can fit inside one another. This is like saying that each sister holds a place inside of you. These dolls are usually gotten in size order from the oldest to the youngest sibling. Before deciding on this, it’s usually a good idea to ask the oldest about size since she’ll have the biggest. Colourful tattoos generally draw the eye towards them quicker as the colour makes them ‘pop’. Flowers especially tend to look a lot more detailed in colour. So think about the tattoo design you want, then decide whether it would look better in colour or in black ink. You can even get them in the colour that best represents you to make them even more sentimental. If you’re close in age, we wouldn’t be surprised if your parents used to dress you solely in one or two colours when you were growing up. Getting the date or year that your sister was born tattooed on you is a very sentimental idea. Everyone who sees it is going to recognise that the date is linked to you somehow. Whereas getting something like a love heart tattooed on you, won’t immediately link you to your sister. Though make sure you’re picking a design that has the most amount of meaning to the two of you. The wrist is a location that is almost always going to be on display. It’s a great choice if you continuously want to showcase the bond between you and your sister. Though if you are getting a tattoo in this area, a small design is usually the way to go. The daintier it is in this location, the sweeter it will look. Picking the location where you want to get your tattoo can sometimes be as hard to decide on as picking the actual tatt. 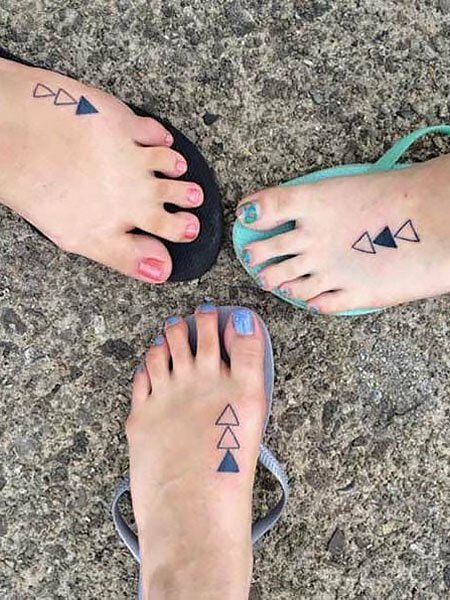 For a sweet and simple sister tattoo, there are some places that are better suited than others and the foot is one of them. While its a bit of painful area, foot tattoos look excellent and can be easily hidden if needed. Shoulder tattoos can be gotten on the front or back, either way, both placements look super cute. Keep in mind, your shoulders are generally on show all summer. 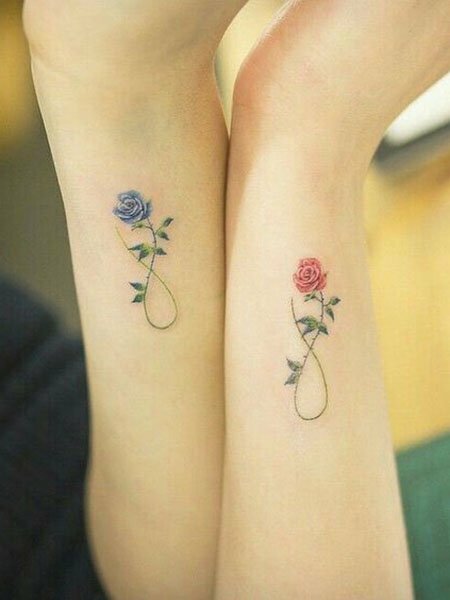 Therefore, unless you’re the kind of girl who wants to add her sister tattoo to her half sleeve, a simple design is usually best suited. Behind the ear is a very small and discreet location. You’ll only be able to pick this placement if your design is delicate enough to fit. It’s a great area to get small flowers, hearts, dates or roman numerals but they must be kept simple. Your design is always going to be more sentimental than your placement. Don’t jeopardise that because you’ve decided on getting it behind the ear. You’ll find that all memorial tattoos include either the date of birth, death or both. They’re also usually followed by either a touching quote or fitting design. 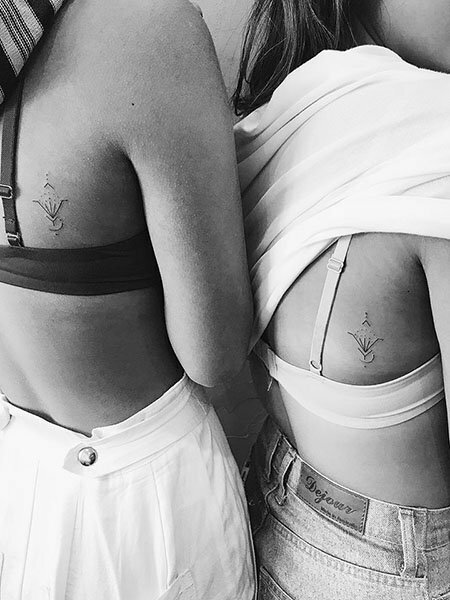 Memorial tattoos may even be more sentimental that matching sister tattoos. They’re a wonderful and touching way to remember your loved one and keep them close to you forever. 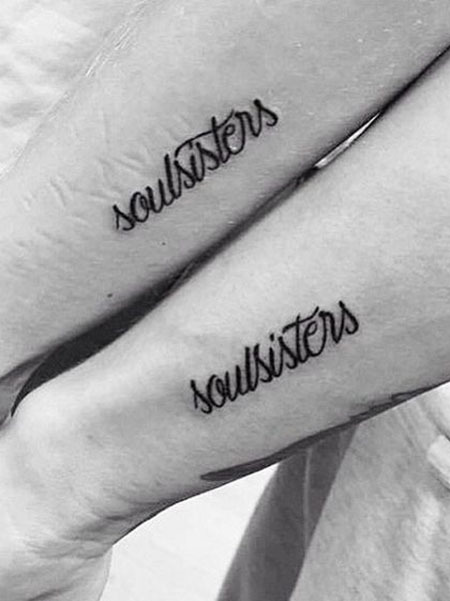 Soul sister tattoos can be written in any font of your choosing. They are perfect for two very close friends who feel like they’re sisters at heart. Though that doesn’t mean that actual sisters can’t get them too. This tattoo has a lot of meaning; it says that you’re not just sisters by chance, but by choice.